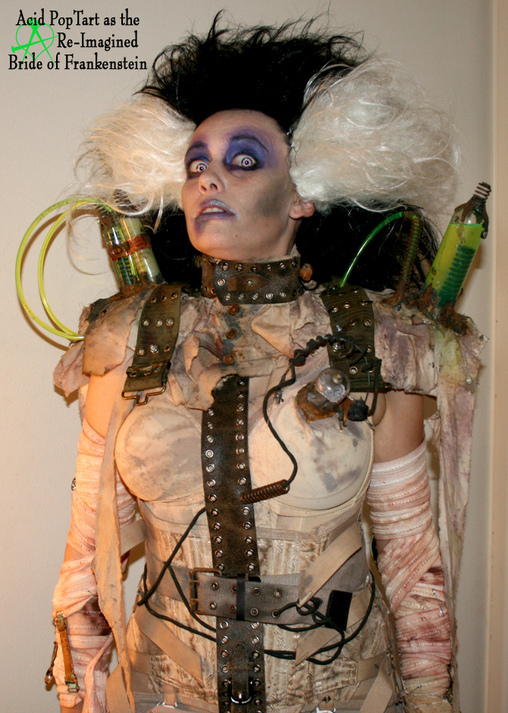 This homemade costume for women entered our 2011 Halloween Costume Contest, and won 1st place in the Most Creative Costume nomination! This is my most labour intensive costume by far, from concept to construction to the actual putting on of the costume. From my initial sketches to completion of the product (including the wig that I made) it probably took around the ballpark of 60 hours. I wanted to blend science with the magic of playing a god and bringing life to something and still keep tribute to the original Elsa Lancaster with her distinctive hair. Each fabric item was individually coffee or tea stained first and then later aged further with fabric dye. Most of the bandages are hand ripped muslin with the exception of the arms which is I believe upholstery trim which had a very stretchy quality to them which I needed. All the metal bits you see are salvaged from various sources and most were pre rusted to boot! The thing "plugged" into my "heart" is an actual 1950's vacuum tube along with some 50's wiring and plug - one good thunderstorm and I was going to be more ALIVE than I bargained for! Test tubes and tubing are all filled with greenish liquid and sealed, with coils attached to the tips and around the tubing. All the "corrosion" you see is actually dripped hot glue which I primed then painted with an iron paint and then rusted and aged. There are actual bolts on my neck although it's hard to see. One leg has a test tube with tubing strapped to it and the other has another tube that pulsed softly first a red light then green then purple then blue. That wig is huge, even as I designed it and had it on my wig form, it didn't look that huge until I put it on! I'm wearing light purple sfx lenses to add to the surreal effect. 8" platforms gave me the height I needed. It was an intense project and took a surprising amount of time to even get into it, I was quite literally BOLTED in. By far, this is my favourite costume. This is an amazing costume. The attention to detail is incredible and certainly major motion picture worthy. There is a lot of originality here as well as a nod back to the original version. You have to respect the artistic genius that goes into making something like this. I've flipped through these pictures several times and each time I see a new detail that was obviously handled with as much attention and care as every other element that makes this "creation" what it is. I've always been more of a fan of Dracula than I am of Frankenstien, but this costume certainly makes me reconsider.